It is sad that the United Nations, UNHRC and the International Community have ignored the claims, sacrifices and sufferings of the Tamils in Tamil Eelam at the hands of the Sinhala/Buddhist hegemony since 1948. The British who amalgamated the Sinhala Nation and Tamil Nation in 1833 for their easy administration and while leaving the country the British passed the baton of power to the hands of the Buddhist Sinhalese and weakened the Tamil Nation that existed before. The United Nations adopted the International Covenant on Economic, Social and Cultural Rights and the International Covenant on Civil and Political Rights in 1966, Article 1 of both these International Covenants state ‘All peoples have the right to self-determination. By virtue of that right they freely determine their political status and freely pursue their economic, social and cultural development”. Tamils have experienced discrimination, denial of the rights to self-determination, abrogated agreements and violations of international human rights and humanitarian law amounting to GENOCIDE by successive Sri Lankan Governments. As Tamils, we share the common racial and ethnic identity and belong to one race though we may be spread out in different geographical location. We also have a very strong cultural homogeneity, Pongal remains our most revered and respected cultural festival, our ways of dressing and food habits make us special people. Tamil our mother tongue is a binding factor irrespective of our differences based on religion or region. It has to be noted that in 2011, the Office of the United Nations Independent Expert on the Promotion of a Democratic and Equitable International Order was established by Human Rights Council Resolution 18/6. On September 10, 2014, A/HRC/27/51. to the Council and on October 27, 2014, the Independent Expert presented his third report to the General Assembly on the right to self-determination [A/69/272] In the press release issued the following day, he stated: “The realization on the right of self-determination is essential to maintaining local, regional and international peace and must be seen as an important conflict-prevention strategy”. The burning of the Tamils Library in Jaffna in May 1981 [One of the best library in the east – with thousands of volumes of rare books and palm leaf manuscripts, original copies of regionally important historical documents, political, history of Sri Lanka etc. 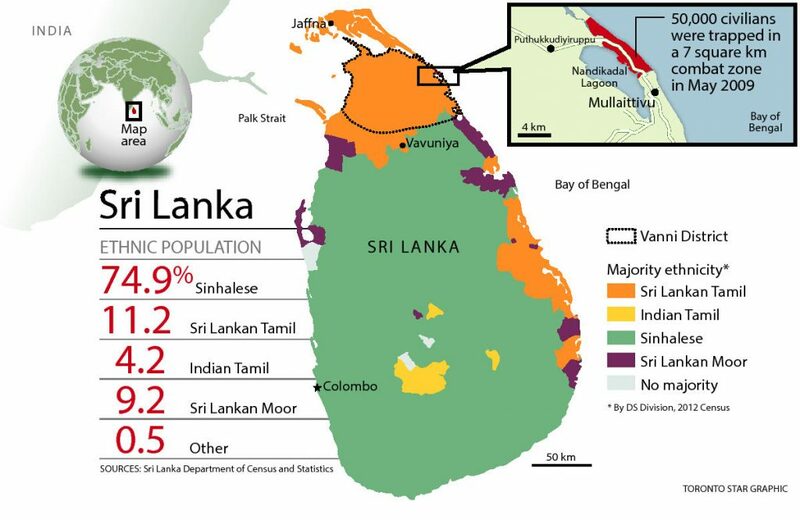 The above constitute evidence of the resolute and determined efforts of alien Sinhala Governments to subjugate and assimilate the people of Tamil Eelam within the framework of a unitary Sinhala Buddhist Sri Lankan State. The people of Tamil Eelam have suffered long enough for their human rights. Today, they are a people who can no longer be denied their right to self-determination. If the United Nations and United Nations Human Rights Council recognize and respect Human Rights to preserve world order, the Right to Self-Determination of the Tamils must be recognized and the crime of GENOCIDE committed by the Sri Lankan state, where 145,679 Tamils are still unaccounted must be punished without any further delay as JUSTICE DELAYED IS JUSTICE DENIED. In addition The United Nations, UNHRC, UN Security Council, International Criminal Court, the co-sponsors of the UNHRC Resolution 40/1 of March 2019 must force Sri Lanka to initiate time bound steps with clear benchmarks to fully implement what was promised in 2015 [UNHRC Resolution30/1. Having obtained two more years the Government must not be allowed squander this opportunity by making false excuses to address accountability. 1. His Excellency Feierstein Daniel – Director of the Center for Genocide Studies at the Universidad Nacional de Tres de Febrero, Professor in the Faculty at Genocide at the University of Buenos Aires. In conclusion The Tribunal finds that “The genocide against the Eelam Tamil group is a continuing process, one that has not yet accomplished the total destruction of their identity. The genocidal coordinated plan of actions reached a climax on May 2009, but it is clear that the Sri Lanka Government project to erase the Eelam Tamil identity, corroborated by the above mentioned conduct, shows that the genocide process is ongoing .The genocidal strategy has changed, the killings are transformed into other forms of conduct, but the intention to destroy the group and its identity remains and continues, through causing serious bodily or mental harm to members of the Eelam Tamil group. Dr. W. Dahanayake, MP for Galle, and one time Prime Minister advised in the Parliament as reported in December 1985. “The government should offer the Tamils a solution they could accept with dignity. They should also offer them a degree of autonomy within the framework of united Sri Lanka. Why can’t the Tamils of Sri Lanka have a government like that of Tamil Nadu, in the North and East of Sri Lanka? Finally, the frustration of the Tamil people is palpable. Faced with continued military occupation of land and the daily overwhelming presence of soldiers across the North-East, including perpetrators who remain unpunished for mass atrocities, the Tamil people have been unequivocal in expressing their exasperation at the lack of progress. Only an internationalised mechanism, free from Sri Lankan interference will provide Tamils justice.